Rhabdomyoma is considered the most common cardiac tumor in childhood.,,,,,,, In general, rhabdomyomas are multiple, well circumscribed, noncapsulated nodules, found most commonly in the ventricles. They may cause obstruction of blood flow and or arrhythmias.,,,, Outflow tract obstruction is the most common complication; inflow obstruction has rarely been reported. A 7-month-old female infant was referred due to severe cyanosis. She had been normal at birth but developed feeding difficulties 6 weeks before presentation and cyanosis 2 weeks later. At the time of admission, she weighed 6.1 kg, was critically ill with low cardiac output (CO), weak peripheral pulses (heart rate 144 bpm), blood pressure (82/40 mmHg), and central cyanosis (oxygen saturation 63%). 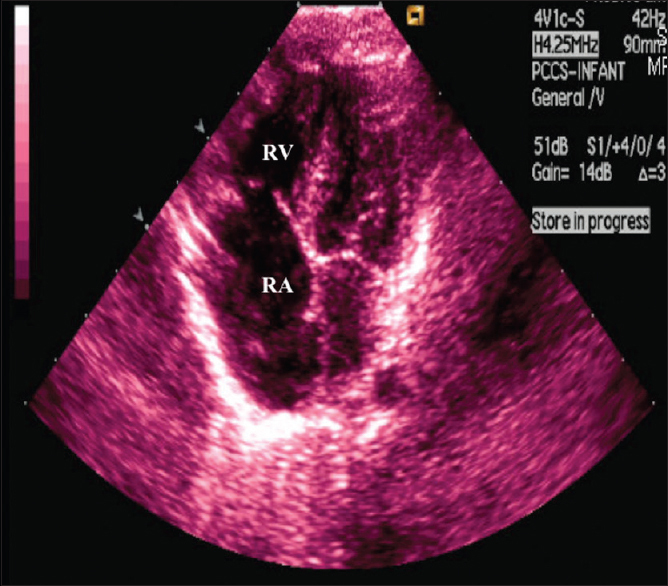 Echocardiography revealed a massive RA tumor measuring 33 cm × 31 mm causing almost complete inflow obstruction of the tricuspid valve. 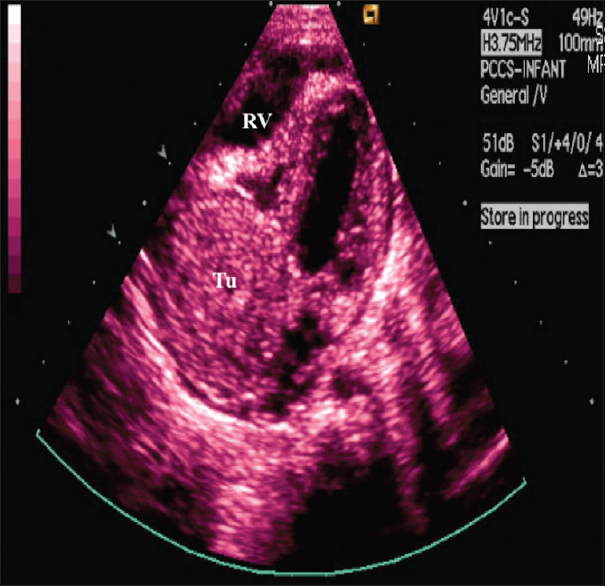 The right ventricle (RV) appeared underfilled. A stretched patent foramen ovale (PFO) was allowing a right to left shunt across, resulting in venous blood entering the systemic circulation with consecutive drop in oxygen saturation. No other tumors were seen in any of the other cardiac chambers [Figure 1] and [Figure 2]. While the chest radiograph appeared normal, the electrocardiogram showed RA enlargement. During emergency cardiac surgery, a solitary tumor was removed from the RA It was found to be encapsulated, measured 30 mm × 30 mm, had a broad-based stalk and arose from the RA appendage. The RA was markedly dilated, with the tumor occupying its entire cavity, while the RV was much smaller. The tumor was completely excised along with part of the appendage and the PFO closed. An initial attempt to separate from cardiopulmonary bypass (CPB) failed despite high inotropic support with dobutamine (10–15 mcg/kg/min) and epinephrine (0.1 mcg/kg/min). 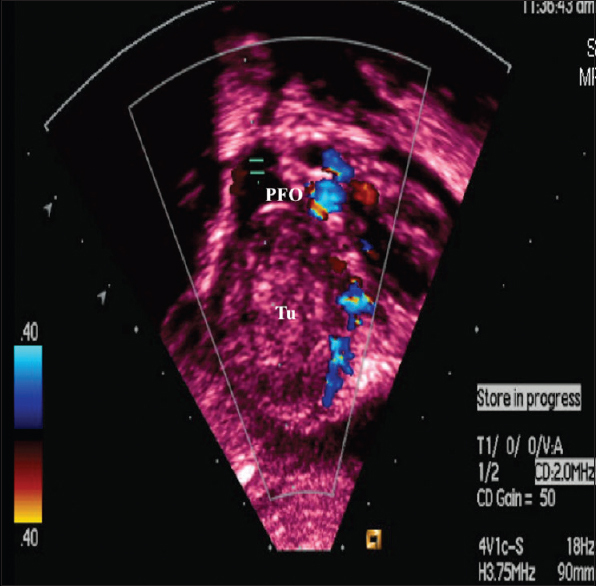 The small RV in combination with moderate tricuspid regurgitation led to a low CO state. Subsequently, a bidirectional Glenn shunt operation was performed, and the child weaned off from CPB with dobutamine 5 mcg/kg/min and epinephrine 0.05 mcg/kg/min after a total CPB time of 66 min. The immediate postoperative echocardiogram showed a large RA and small RV with moderate tricuspid incompetence and systolic dysfunction. Histologic examination of the excised tumor revealed a rhabdomyoma. The child remained hemodynamically unstable for 3 postoperative days requiring high doses of dobutamine (up to 10 mcg/kg/min). She gradually improved and was successfully extubated on the 5th postoperative day. RV function was normal by the 6th day [Figure 3]. Inotropes were tapered off, and the patient was fit for discharge by the 8th postoperative day with normal central venous pressure and an oxygen saturation of 94%. She was subsequently discharged home on aspirin. Cardiac tumors in children are rare (0.03%–0.32% of patients) and present early in life. A multi-institutional database of children undergoing cardiac surgery for tumors showed 42 out of 120 children had rhabdomyoma, most often noted in ventricles. In a study by Nield et al., 28% of the patients had tumors in the right ventricular outflow tract (n = 13) or left ventricular outflow tract (n = 23). In a single-center study of 6 patients, the tumors mostly originated from the left ventricle. A more detailed analysis by Beroukhim et al. described 78 patients with 85 tumors of which only 10 were located in the RA (11%). The most common indication for surgery has been flow obstruction,, of which outflow obstruction is significantly more common than inflow obstruction. Surgery has been the definitive treatment, occasionally on an urgent basis. Pucci et al. involved 24 postnatal cases, of which 7 patients underwent surgery with 3 mortalities. Patients usually present with arrhythmia. Tumor obstruction is rarely the cause for emergent surgery. One of the largest series of cardiac tumors presented with arrhythmia including ventricular tachycardia requiring surgical management; others have reported combined surgery and radiofrequency ablation. Cavopulmonary connection has been previously performed in a case with rhabdomyoma, but without details described. In our case, the inflow obstruction seen in preoperative echocardiography had not allowed the RV to facilitate adequate CO. In our case, the tumor was completely excised along with part of the RA appendage and the PFO closed. After tumor excision, an initial attempt to separate from CPB failed since the small RV in combination with moderate tricuspid regurgitation led to a low CO state. Subsequently, a bidirectional Glenn shunt operation was performed and the child was weaned off from CPB. At the time when the decision for the Glenn shunt was made, other options such as the use of venoarterial (VA) extracorporeal membrane oxygenation (ECMO) for circulatory support or nitric oxide ventilation for decrease of pulmonary pressure to help offloading the RV were not available and the Glenn shunt was considered the best available option. In recent years, the use of ECMO as one form of extracorporeal life support has been increased throughout the world and presently may represent the state of the art. In this context, Maybauer et al. reported cases of patients with Ebstein's anomaly who presented in cardiogenic shock, one postcardiotomy and one with severe biventricular failure caused by an acute thrombotic event with anatomical narrowing and inflow obstruction similar to the present case. VA-ECMO was initiated and was considered as bridge to either recovery, or ventricular assist device, or to the heart transplantation. However, the patients were stabilized and recovered on VA-ECMO within days because time was crucial to adapt to the increased RV blood volume. A similar approach could have been possible in our patient if ECMO was available at the time and may have been more beneficial than having a Glenn shunt with its own long-term issues. Right ventricular inflow obstruction is rare presentation of rhabdomyomas. In cases of RV failure, nitric oxide ventilation reduces RV afterload and is helpful to improve RV performance. In severe cases, a cavopulmonary shunt (Glenn shunt) as surgical treatment and ECMO for circulatory support are very useful tools to separate from CPB. Nield LE, Mendelson M, Ahmad N, Manlhiot C, Jaeggi ET, McCrindle BW, et al. Clinical review of obstructive primary cardiac tumors in childhood. Congenit Heart Dis 2014;9:244-51. Kutluk T, Demir HA, Büyükpamukçu M, Ozkutlu S, Akyüz C, Varan A, et al. Cardiac rhabdomyomas in childhood: Six cases from a single institution. Turk J Pediatr 2013;55:69-73. Penha JG, Zorzanelli L, Barbosa-Lopes AA, Aiello VD, Carvalho VO, Caneo LF, et al. Heart neoplasms in children: Retrospective analysis. Arq Bras Cardiol 2013;100:120-6. Beroukhim RS, Prakash A, Buechel ER, Cava JR, Dorfman AL, Festa P, et al. Characterization of cardiac tumors in children by cardiovascular magnetic resonance imaging: A multicenter experience. J Am Coll Cardiol 2011;58:1044-54. Pucci A, Botta G, Sina N, Tibaldi M, Valori A, Grosso E, et al. Life-threatening tumors of the heart in fetal and postnatal age. J Pediatr 2013;162:964-90. Haydin S, Onan B, Kiplapinar N, Akdeniz C, Tuzcu V, Bakir I, et al. Combined resection and radiofrequency ablation of rhabdomyoma in a child with sustained ventricular tachycardia. J Card Surg 2012;27:649-52. Padalino MA, Vida VL, Boccuzzo G, Tonello M, Sarris GE, Berggren H, et al. Surgery for primary cardiac tumors in children: Early and late results in a multicenter European congenital heart surgeons association study. Circulation 2012;126:22-30. Bielefeld KJ, Moller JH. Cardiac tumors in infants and children: Study of 120 operated patients. Pediatr Cardiol 2013;34:125-8. Maybauer MO, Vohra A, O'Keeffe NJ, Prodromou OE, Maher W, Haravi H, et al. Extracorporeal membrane oxygenation in adult congenital heart disease: A case series and literature review. Crit Care Resusc 2017;19:15-20.